One year: Scattered wood chips will fade to brown with a layer of pine needles above. Native grasses will sprout. Two years: The bluff will bloom with wildflowers, especially the bold yellow of the arrowleaf balsamroot because of extra sunlight to the ground. Five years: Healthier trees with bigger growth rings. The trees will begin to fill with more needles because of extra sunlight. 10 years: Hikers will notice minor growth in trees: only an inch or two difference in diameter. 35 years: Today’s small trees could double or triple in size, with fuller tree tops. 100 years: Pine trees along the bluff will grow to about 18-20 inches in diameter. Down the steep High Drive Bluff, it smells like the holidays as forestry crews chip away at pine trees. The crew of seven has been working the bluff since October under a $50,000 grant from the Department of Natural Resources to the city’s Urban Forestry program to clear undergrowth and reduce the risk of intense fires along the South Hill’s recreational treasure. Neighbors involved with Friends of the Bluff also recognize the risk and have volunteered their time to clear vegetation, trim trees and remove garbage, including rusting cars. 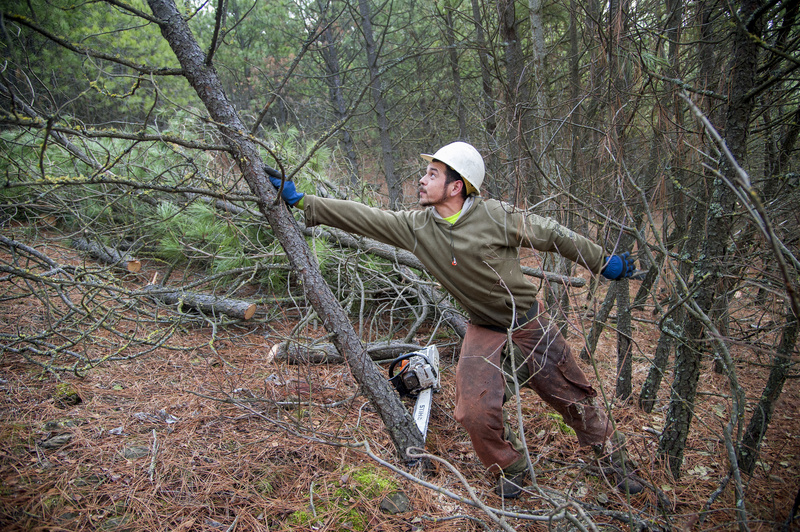 The work will make a thinner forest that allows for bigger, healthier trees. If a fire were to start, the work reduces the risk that it would escalate. Plus, undergrowth removal makes it easier for fire crews to trek the bluff. Because the volunteer group lacks industrial-grade equipment, they’re tackling the bluff near the street level of High Drive, thinning one acre at a time. “We want to reduce the risk of sparks blowing on top of homes” if a fire starts on the bluff, said Diana Roberts, an organizer for Friends of the Bluff. Meanwhile, the DNR crew works midway down the bluff, using a diesel chipper to shred small trees and vegetation, spreading a layer of chips on the forest bed on private land and parkland owned by the city of Spokane. Gifford said they’re making excellent progress since they started in October. Initial expectations mapped out about 50 acres for work, and efficiencies have reduced the cost per acre by about 20 percent. Depending on weather, Gifford expects they’ll be working along the hillside until late December, expanding the project to about 110 acres with an additional $39,000 recently gained from delayed projects.